As designated by the Idaho Department of Agriculture, a plant is noxious when it is considered to be injurious to public health, agriculture, recreation, wildlife, or property. Noxious weeds are generally spread by the dispersal of seeds, or other plant parts, by wind, water, animals, machinery and people. Weeds can produce seeds with barbs, hooks or other attaching devices that facilitate easy adherence to people, animals or equipment, and can cover great distances as society has become increasingly mobile. Some noxious weed, have been introduced by ill-advised horticultural plantings, while others were inadvertently dispersed through the planting of contaminated crop seeds, the feeding of weed seed contaminated forage to livestock, or on vehicles, boats or other machinery. As noxious weeds typically are not native to the ecosystem that they impact negatively, there are often no natural processes to limit the growth or spread of the plants, and they “out-compete” native plant species. Noxious weeds pose a significant threat to landowners, agricultural interests and natural ecosystems throughout Ada County. The ability of noxious weeds to produce monocultures that considerably alter landscapes makes it imperative to control their dispersal. This requires collaboration between landowners, farmers, ranchers and government agencies (including the Ada County Weed Control Department) to solve the great challenge of controlling and eradicating noxious weeds. Pursuant to Idaho Code 22:24-07, Idaho’s Noxious Weed Law specifically requires that invasive weeds are to be controlled both on public and private land by the individual, company or agency owning the land. Native Plant: A plant that occurs naturally in a particular region, ecosystem or habitat without human introduction. Non-Native Plant: A plant introduced with human assistance (intentionally or accidentally) to a new place or new type of habitat where it was not previously found. Naturalized Plant: A plant that does not require human assistance to reproduce and maintain populations, over time, in an area it is not native. Invasive Plant: A plant that is both non-native and naturalized in an area. Invasive plants can grow quickly and spread to the point of disrupting plant communities or ecosystems. Weed: A plant growing where it is not wanted. Weeds can be native or non-native, invasive or non-invasive and noxious or not noxious. Noxious Weed: A plant designated by government officials as injurious to public health, agriculture, recreation, wildlife or property. Once a weed is classified as noxious, authorities can implement quarantines and take other actions to contain or destroy the weed and limit its spread. Early Detection/Rapid Response Weed: A weed that has been identified by a governing body as a high priority to prevent from being introduced to a region. If any of the plants listed in the Idaho Administrative Code (Subsection 100.01) are found to occur in Idaho, they shall be reported to the Department of Agriculture within 10 days following positive identification by the University of Idaho, or other qualified authority. These weeds shall be eradicated during the same growing season in which they are identified. Why are Noxious Weeds a Problem? Of the more than 2,000 weed species spread throughout the country, more than 800 can be found in Idaho. To date, 67 species have been categorized as noxious weeds by the Idaho State Department of Agriculture, and 35 species are present in Ada County. Noxious weeds have contributed to the decline of 42% of U.S. endangered and threatened species, and are the primary cause of decline for 18% of U.S. endangered or threatened species. To learn more about these species, look at the Noxious Weeds of Idaho page. Thousands of acres are impacted by noxious weeds throughout Idaho. The most challenging species of weeds spread easily and have a major impact on native species. They “out-compete” native plants for sunlight, water, and space by reproducing at a higher rate, being highly adaptable and by not having any natural controls (e.g. many noxious weeds cannot be grazed). Decreasing overall plant diversity and displacing native vegetation. Altering the functions of natural ecosystems. Increasing soil erosion rates, sending sediment into streams and degrading water quality. Replacing native plants with plants that cannot be grazed for agriculture. Interrupting aesthetic and visual values. Reducing the quality of national forests. Contributing to the fuel load that leads to wildfires. Impacting irrigation, power generation and recreation. Maintaining a healthy ecosystem should be the primary objective to help keep invasive species off your property. An Integrated Pest Management (IPM) program is a process consisting of the balanced use of cultural, biological and chemical procedures that are environmentally compatible, economically feasible and socially acceptable to help reduce pest populations. The Ada County Weed Control Department uses a comprehensive and coordinated program for the prevention, eradication, and management of noxious weeds. Along with an aggressive plan for controlling and eliminating noxious weeds, the division also works to control vectors or methods by which a noxious weed can be spread throughout the county. Education and outreach is also an important component of the Ada County Weed Control IPM program, as public involvement is imperative to control the spread of noxious weeds throughout the county. Ada County is well-positioned to deal with noxious weeds already present in the county, as well as noxious weeds or undesirable species that may invade or may be introduced in the future. 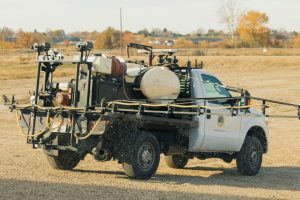 The Ada County Weed Control Department offers a variety of services from off-road, to rangeland and even aquatic weed control for county residents dealing with noxious weed issues. Fill out an online Request for Service form and one of our staff members will contact you.